The following list has been compiled from primary references or creditable authors. It is neither comprehensive nor definitive, but merely attempts to demonstrate the interest in Freemasonry found in all spheres of society. Although the authors noted at the end of the list write with some authority, they do not always provide citations. Membership therefore cannot be considered confirmed unless a lodge name is supplied. Biographies for some of those listed can be found in our Biographies section. Although these men were freemasons, they neither represent nor speak for Freemasonry. Douglas Campbell: P.M. Assiniboine Lodge No. 7, Portage La Prairie. Noted on a separate page. James Thomas Milton Anderson: (C) September 9, 1929- June 19, 1934 [b. July 23, 1878- d. 1946] i. March 26, 1921 - Banner Lodge No. 154, Regina. Thomas Clement Douglas: (CCF) July 10, 1944 - 1961 [b. October 20, 1904, d. March 7, 1995] i. April 1, 1935, Wayburn Lodge No, 20 GRS, Wayburn. William Melville Martin: (L} October 20, 1916 - April 22, 1922 [b. August 23, 1876, d. June 21, 1970] i. 1900, Harriston Lodge No. 262, Harriston, Ontario. Grand Master: 1927. William John Patterson: (L) November 1, 1937 - July 10, 1944 [b. May 13, 1886, d. June 10, 1976] i. February 9, 1909, Evening Star Lodge No. 10, Grenfell. Wilbert Ross Thatcher: (L) May 22, 1964 - June 30, 1971 [b. May 24, 1917, d. August 23, 1971] i. April 6, 1956, St. Georges Lodge No. 136, Moose Jaw. Sir Sandford Fleming (1827-1915), creator of first Canadian postage stamp, and standard time. George Brent, Saskatchewan Huskies hockey team captain, 1940. John F. McCreight, first premier of B.C. Bishop Acton W. Sillitoe, first Bishop of New Westminster. Cascade Lodge No. 12 a. 1889/05/14. Union Lodge No. 9: a.1886/04/05. Lodge of Honour 526, UGLA. Robert James Cromie (1887-1936), founder Vancouver Sun newspaper. r. 1910/05/23: Western Gate Lodge No. 48. Ontario records compiled by Milton Hill from the records of the Grand Lodge of Canada in Ontario, lodge records and John Ross Robertsons The History of Freemasonry. Edward Jenner (1749-1823), physician, discoverer of smallpox vaccine. Erasmus Darwin (1732-1802) physician and botonist. i. at St. Davids Lodge No. 36, Edinburgh in 1754. James Watt (1736-1819) developer of the steam engine. i. 1763. King George VI. Navy Lodge No. 2612, London, England. Rowland Macy, department store founder i.Merrimack Lodge, Haverhill, Mass. Horace Saks, Saks Fifth Avenue. David Rice Atchison, "president pro tempore": March 4, 1849. member: Platte Lodge No. 56, Mo. Abbott, G. Blizard. Masonic Portraits: Sketches of Distinguished Freemasons. London, W. W. Morgan: 1879. Baird, George W.. Memorials. Little Masonic Library. Harrison, Jim. Biographical Journal of Freemasons: British Columbia and the World. Gavel Historical Society of British Columbia, Vancouver: n.d..
Harrison, Jim. Freemasons Who Made a Difference. Gavel Historical Society of British Columbia, Vancouver, :1993. Haywood, H. L. Famous Masons. Macoy Publishing and Masonic Supply Company, Inc., Richmond, Virginia:1968. J.G. Masonic Portraits: Sketches of Distinguished Freemasons. W. W. Morgan, London: 1876. Lennhoff, Eugen. "The Freemasons". Oxford University Press. New York: 1934. Mackey, Albert G., Encyclopaedia of Freemasonry, An. The Chicago Masonic History Company, Chicago: 1966. Scottish Rite Journal. Washington, D.C.. [published monthly]. Waite, Arthur Edward. New Encyclopedia of Freemasonry, A. University Books, New York: 1984"
American Mason. Andrew Boracci, ed.. Sag Harbor, NY. 1997- <aboracci@optonline.net>. Hamill, John et al.. Freemasonry : A Celebration of the Craft. JG Press 1998. ISBN:1572152672. Masonic Service Association of North America, Short Talk Bulletin series. Philatelic Freemason, May-June 2001. http://www.msana.com/emarchives/emjun01.htm. The Phylaxis Society Public Affairs Office and Masonic Information Center. William R. Denslow, Freemasonry and the American Indian, Missouri Lodge of Research, St. Louis: 1956. Masonic Americana, Paul C. Rodenhauser, Chicago, Knights Templar Magazine: 1975. Grand Lodge of British Columbia & Yukon. Membership records. Paul C. Graham, "The Masonic Moroni" <geocities.com/masonicmoroni/> ; cf. "Journal of the Illinois State Historical Society," Spring 1971, p. 81. Whos Who in British Columbia (Registered) 1944-45-46. S. Maurice Carter, ed. & publisher, Vancouver. "The Year 1922 in English Masonry," Dudley Wright. 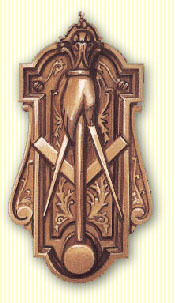 The Builder National Masonic Research Society. March, 1923. p. 90. The Phylaxis. Boston : The Phylaxis Society, 1981. Third Quarter p. 58. Herbert G. Gardiner, P.G.S. Grand Historian, Grand Lodge of Hawaii (March 15, 2002), Northern California Research Lodge.